Mobile page speed is an official Google ranking factor since July 2018. Make your store much more Google and user-friendly by optimizing your code structure with Magento Speed Optimization extension. Automatically reduce the size of product image files without affecting their quality and use advanced JS/CSS minification options to improve your website performance and get a higher score in Google PageSpeed Insights. 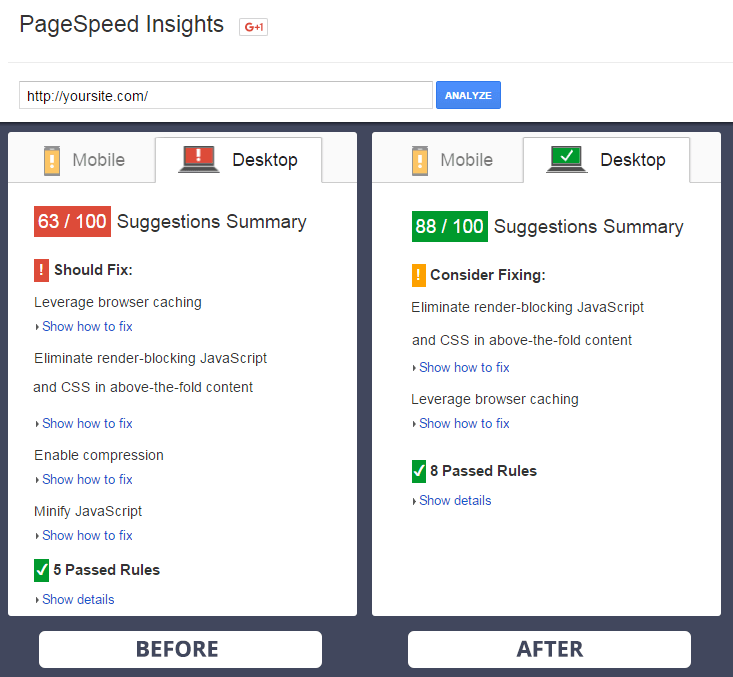 NOTE Сheck your website score with the Google PageSpeed Insights tool to see that you need improvements. With the module you'll make your code structure as clear as possible and will definitely see positive results for your desktop version. Prevent losing potential customers by making your site perform better. See the results of optimization with help of Google PageSpeed Insights tool for Home page , Category page , and Product page . Use our Google Page Speed Optimizer extension and you will definitely improve your store score. Due to the speed optimization tool you can automatically compress all product images (jpeg, png, gif) generated by Magento without quality loss. Use CLI (command line interface) to compress pictures placed in media and skin directories. The CSS minification option enables you to automatically remove all unnecessary characters like new lines or comments without affecting your source code. With the debug option all possible minification errors will be accurately logged. To avoid probable issues with the file content encoding, you can specify URL as a minification source. The good module. But long I tried compress my images but they didn’t compress. I was angry with it and wrote to support. They fixed it in 2 weeks only. Now it works. Say thanks to a support, though it could be made faster. I installed the extension and ran through all the steps to configure it. Seemd, that everything was ok. But when I checked the results – nothing’s changed, the speed was the same. I was very disappointed an’ nervous. I turned to support with it. And then they did magic! I don’t now what they did, but now the module works nice and does its job. Many features to improve website performance. I totally recommend. As for the minuses, recently I’ve had an issue with HTML minification. Support team fixed it very qucckly, so these guys indeed work hard not to lose face. The module is very easy to use – u just switch it on and wait for results. Except image optimization – this thing is a bit tricky. Results btw are quite promising as ranking keeps improving. Though this improvement can be also the result of other activities that we do, the module definitely does its job well. We were surfing for some tools to improve the SEO on our site. And this module was the choice. It took big efforts to install an’ tune up it (not without the help of a support manager). But we managed all the difficulties and now enjoy the results. Good job, Amasty. When I came across the extension, I thought it was an advanced and super complicated one. But the description made me think about the speed of my website and… I decided to try it. Everything went ok, I’ve installed it and then configured - it's much easier than I thought. And now I see the difference in page download, it’s really faster. Thank you, guys, for a good quality product. We’re using this extension for 3 months. Well, it does take time to understand how to configure it. But it works! We compared the results in the Google PageSpeed Insights. It’s awesome! Good results, the score has really increased. I would like to have this extension combined with your FPC as they can beneficially complement each other. I am very pleased with this extension. It works exactly as expected. Recommended. I should admit - the app really does its job! Despite some settings configuration pitfalls, I'm fully satisfied with it. Soon after running the app I checked my score in google page speed tool and was surprised as the score had increased by 25 points. Hope this will have a positive impact on my positions in SERP.